Alex Radunsky decided to attend Yavneh Academy of Dallas for one reason: Most of his Akiba Academy of Dallas friends were going there. Radunsky would graduate in 1998, Yavneh’s first graduating class, though at the time, he was unaware of whether, or if, the school would survive. 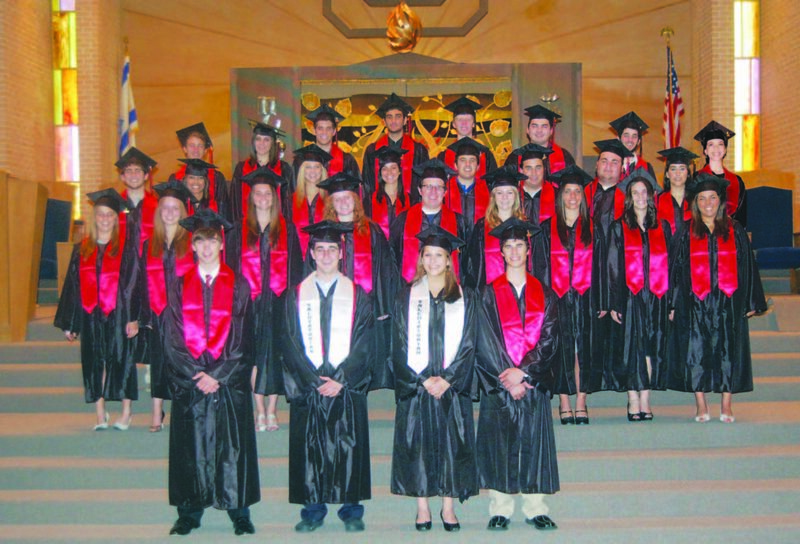 Twenty-five years after its launch in a small building on the campus of the Aaron Family Jewish Community Center, Yavneh has grown into a well-respected, highly acclaimed preparatory Dallas-area Jewish high school. The school’s focus is that of modern Orthodox study, combined with stringent secular education. Yet, Yavneh’s overall goal is to “appeal to the entire Jewish community, regardless of observance or denomination,” said David Radunsky, Alex’s father and a member of one of Yavneh’s founding families. Added Rabbi Howard Wolk, who led Congregation Shaare Tefilla at Yavneh’s founding and is now community chaplain for Jewish Family Service of Dallas: “Yavneh allowed Jewish kids to continue their Jewish education, and for them to be with other Jewish kids.” Wolk, one of Yavneh’s founders and among its first teachers, sent his three sons to Yavneh. While Deena Zucker was attending seventh grade at Akiba during the early 1990s, parents Michael and Karen Zucker faced a difficult decision. The family would have to send their eldest child out of town for a Jewish high-school education. This dilemma prompted the Zuckers to join other families interested in forming a local Jewish high school. “I didn’t want to send her out of town,” Michael Zucker said. “I didn’t want my child being raised by someone else.” Deena and her siblings Sara and Arye ended up attending and graduating from Yavneh. Meanwhile, the Zuckers’ youngest, Nachi, will graduate in 2019. Yavneh allowed both families, and others, to keep the children home, while keeping other Jewish families anchored to the region. Wolk commented that one of the school’s main benefactors, Oscar Rosenberg, had a strong sense that, without a Jewish high school, families not wanting to send their children out of town would leave. “Yavneh helped us hold on to important families in the community,” he said. 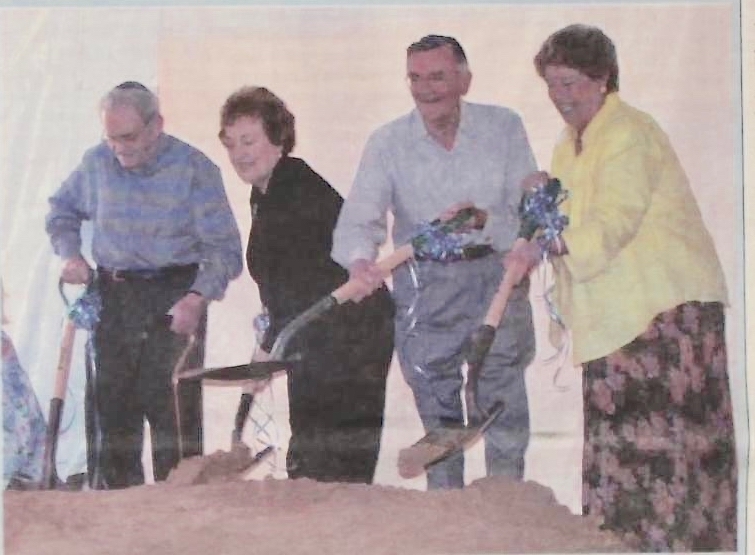 From the TJP file: Ecstatic to break ground on the Schultz-Rosenberg Campus on May 9, 2004 were, from left, the late Marcus Rosenberg, Ann Rosenberg, Howard Schultz and the late Leslie Schultz. Though a Jewish curriculum is a highlight, Yavneh also focuses on a rigorous secular program. David Radunsky pointed out that the goal of the school, overall, was to provide an outstanding preparatory school for college and life. “It’s an opportunity to have an excellent, small private-school experience, which focuses on education and strong student-teacher relationships,” said David Portnoy, Yavneh’s head of school. “College admissions deans have told us they find Jewish high-school graduates very well prepared to take on the workload and time management of college,” Portnoy said. Furthermore, the students found a flexibility that might not have been possible in other school settings. Alex Radunsky tells the story of Advanced Placement (AP) classes, with one of the first being a physics class. “But I said I didn’t want to take AP physics. I was more interested in AP biology,” Alex recalled. Yavneh managed to include an AP biology class for Alex and another student. “The institution put a lot of energy into making that happen,” he said. Yet, at the beginning, Zucker, Yavneh past president, acknowledged the risks in sending his eldest daughter to a school that, in its first five years of existence, relocated at least five times, had a handful of teachers and a series of heads of school. “Yavneh was fully accredited,” he said. “But no one had ever heard of it when Deena graduated.” Yet all the Zucker children who graduated from Yavneh ended up with outstanding grades and are pursuing meaningful careers. Bonner agreed, adding that the Jewish day school education offers more than, well, a good Jewish education. Portnoy and others stress the need for the school to be a self-sustaining entity and to continue being a student-driven school with outstanding instruction. This, in turn, requires continuous funding and endowments, which is why the Pam Hochster Fine and Jeffrey R. Fine Yavneh Academy Scholarship Endowment Fund (see sidebar), as well as other donations and endowments, are so important. Such resources help the school continue recruiting and retaining excellent teachers, Portnoy said. Still, as Yavneh celebrates its silver anniversary, it is a success. The school has its own campus. Its students graduate and attend prestigious colleges that include Harvard, Yale, Stanford and the University of Texas. On the sports side, the Yavneh boys’ soccer and basketball teams have made it to state and national finals. “We’re on the map now, both in terms of North Texas schools and national Jewish schools,” Portnoy said.